Tox previews the Agents - a new Double Edge Cards Game from Saar Shai! 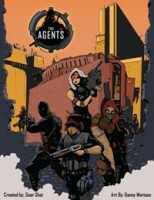 “The Agents” is a card game for 2-5 players in which players try to be the first to reach 40 Intel Points. It is set in a world where a secret organization has been disbanded and it’s agents have been spread out across the globe (there is no real narrative here though, this is merely the setting). It is a game that has few options but has a depth of strategy that is not obvious at first glance. Players start off with a Site in between them and each other player adjacent to them, thus each player has 2 Sites next to them. 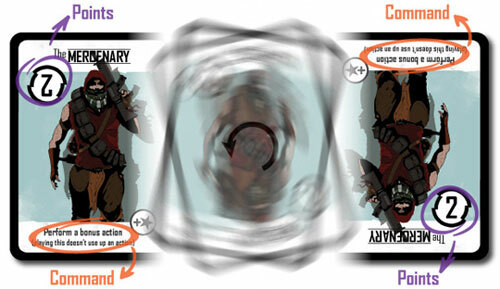 Agent cards can be played to either of a player’s factions during each of their turns (all cards at a Site are called a Faction). Each card that is part of the Site (and the Site as well) has black arrow halves and white arrow halves along the border on both ends of the card pointing towards each player. The colors are always opposite on either end of the cards(i.e. black pointing towards player 1 and white pointing towards player 2). At the end of a player’s turn they net Intel Points equal to the number of completed arrows pointing at them, 2 points for arrows of one color and 1 point for arrows of split colors. The twist here is that the Agent cards that are played to a site also have an ability attached to them. This ability is only available to the player which it is facing, so you can never both get use of an Agent’s ability AND gain the benefit of it’s arrows. Each time you play an agent to a site you have to choose how you are going to benefit yourself and how you are going to potentially benefit the other player sharing the site you are playing to. In addition to scoring Intel Points from Agent cards, there are also Missions. Missions are cards that you can play to a site that have a condition on them which when met nets you Intel Points at the end of each turn. An example of a condition would be something like “If this is your longest faction” and the point value is 1. At the end of your turn if the mission is assigned to your longest faction then you would get 1 extra Intel Point. There are also Free Agents, these are Agents that do not get played to a Site but rather are played to the table between you and any other player (including players that are not adjacent to you). When these cards are played they will give one person Intel Points and another player a one time use ability which they perform immediately. The person playing the cards gets to choose who gets which so choose wisely! This game is player interaction heavy. Literally every time you play an agent it will affect another player in some way. This is one of the reasons I like this game because it really pits your moves against your opponents in a tangible way. Which agents you get at any given time can play pretty heavily into your success. That being said, the agent cards all have a way for you to get points so there should almost always be a way where you can do something useful. The only exception would be if you get nothing but Free Agents, you could be in a spot of trouble. Some house rules could probably fix this though, something like “If you have all Free Agents in your hand you can discard X agents to draw X agents from the Agents deck” or something like that. Skill is definitely a strong element to this game. Each card you play has the potential to help your opponents in some way. Knowing which player with whom to play a Free Agent, knowing the order in which to play cards in order to maximize your points each turn, etc..
That being said the one thing I am disappointed with is the way that missions are implemented. It really seems that if you do not buy missions early on in the game that you are going to lose due to the fact that one of the actions you can perform during your turn is to trade in as many missions as you want WITH ONE ACTION to get the same number of missions. This means that if you get more missions early, then every trade you do is more successful. It sort of forces you into doing this if you want to win and that seems like it reduces the overal strategy. Personally, I like the art style and I feel like it fits the theme of the game very well. The cards have a simplistic design that lends itself to readability and the plastic cards are very nice. The Agents is a fun strategic game, if you like strategy that is. This is not a game that will make you laugh when some combination is pulled off. There are only a set number of actions that can be performed on an Agent and there are inverses of each type (i.e. “Turn an Agent in THIS faction” and “Turn an Agent in your OTHER faction”) so there isn’t going to be some wicked combo that you never really thought of. This fact though is the mark of a good strategy game, the options are limited, but the strategic combinations are not. Overall I like the Agents and think it is a fun and engaging game in which you have to make important decisions each turn. Received my Kickstarter edition (along with 3 expansion packs) a few weeks back and we left the game on the shelves for no specific reason…. We just didn’t want to learn it. Only last week that we decided to give it a try… We should had try it sooner!! It’s a fantastic small game! Component wise, except for the expansions tuck box that were destroyed during shipping, everything else is perfect. I love the feel of the plastic cards and the artwork is amazing (could be a a little too dark, but that’s a minor thing that I think is due to the fact that they decided to switch to plastic cards once the design were completed). Gameplay is very simple to learn, but there is so much to it. The game mechanic of having all Agent cards doing something good for you and one of your opponent each time they are played provides some intense planning and head scratching! I have to say that I’m a fan of games that made you do tough decisions, and this game is all that! As for the expansions, I order one Agents expansion, The ‘Spoof’ Agents, and 2 Missions ones, Mission: Critical and Black Ops. I didn’t try the the Missions ones, but the Spoof agents is a really nice addition, that provides some extra gameplay. In conclusion… Do I recommend that game? If you love quick but intense games, that plays fast with 2-4 players, and love having hard decisions to take each turns, YES! It’s cheap, and really fun! Best with three, good with two. Has alot of exapnsions to spice things around each time. I own the fancy box kickstarter pack, which holds everything nice and neat. The box itself is a graphic marvel. I love the plastic cards, and money as cards (as opposed to chips). Sadly there are too few low denominators, and also only 1 cheatsheet card. The chip quallity is really poor, and I will prob replace those in the future (but they are a part of one specific expansion so no biggy). Add a Review for "The Agents"